Newly Renovated Luxury Ocean Front 2 Bedroom Luxury at Casa Del Mar! The others may say they are 'oceanfront' but this one actually is! While the 5 Star Casa del Mar, as a resort, is beachfront there are only a few units that are actually situated just above the sand and this is one of them. This stunning single story two bedroom condominium has just undergone a MAJOR NEW REMODEL. Everything from the kitchen to the bathrooms, and more has been painstakingly redone to provide the ultimate in luxury for your vacation. This unit offers spectacular ocean views from both master bedroom suites, and all living areas. Feel the sunshine, hear the sound of the ocean, enjoy breathtaking sunsets from the privacy of your own oasis…it doesn’t get better than this. This exclusive, world-class Casa del Mar Hotel and Resort is in the Los Cabos “Corridor”—mid-way between the bustling tourist community of Cabo San Lucas and the quaint, art-filled town of San Jose del Cabo and provides easy access via car, taxi, or shuttle bus from the airport., It’s a first class Five Star Hotel and condominium community with the benefit and amenities of a high end boutique hotel – with the option of fine restaurants and bars, spa, world renowed golf course, concierge service, room service and many inviting swimming pools set in lush tropical landscaping. The hacienda-styled complex is gated and guarded with 24 hour security. This is not a high-rise and densely built resort; no crowded beaches here...Casa del Mar offers beauty and elegance without the commercial trappings of many resorts located in the Cabo area. Additional resort amenities are available to renters for a daily fee of $30 (daily $30 fee covers all guests in condo). 1) At 1650 square feet, it is over 200 square feet larger than the typical 2 bedroom; 2) both bedrooms are oceanfront, as opposed to the majority of the other 2 bedroom condos which have a floor plan where the second bedroom has no ocean view or balcony. 3) It has much larger balcony space and provides room enough outside on this balcony for a dining table, lounge chairs and deck chairs--all completely private! The granite kitchen and its upscale appointments--Brand New stainless dishwasher, stove, microwave, refrigerator, is fully equipped for you stay. There is also a private laundry room with Brand New washer and dryer. The new bathrooms have Golden Marble countertops, Stone detailed flooring inlaid between Crema Marfil, oil-rubbed bronze fixtures, custom mirror trims, new toilets, sinks, alder cabinetry, accessories and more! We also have an English speaking property manager for your convenience as well as the ability to set up maid service, child care, fishing charters and more. We also have free wifi, calls to the US and Canada and a US Satellite television feed. Our growing family has prohibited us from spending as much time in this paradise as we had originally intended. Now our loss can be your gain. We are more than happy to provide you with more photos, or answers and further questions about our condo, the resort, or Cabo in general, so please don’t hesitate to email or call us. Eric and Jacqui Weiss have two boys and live in Pacific Palisades, California. Eric owns a talent agency and represents broadcasters from around the world. Jacqui is in residential real estate in the Los Angeles areas. They have two sons, Benjamin and Zachary. Although they love Southern California, any chance they get they pack up the boys, their swimsuits and head to one of their two vacation homes at the Casa del Mar Golf Resort and Spa in Los Cabos Mexico. Hello...we are Eric and Jacqui Weiss and we own two rental properties at Casa del Mar Resort in Los Cabos. As avid travellers, Eric and I spent much of our time together as newlyweds travelling the globe. Our mutual love for seaside locales led us to Bora Bora, the Amalfi Coast, Costa Rica, Panama, Hawaii, and throughout Mexico to name just a few. When it came time to purchase a second home, though, there was no doubt that Los Cabos would be the place. For over 20 years we have escaped to Cabo and although it is a mere 2 hours from Los Angeles by plane once we are there it seems we have stepped into another world. The climate, the people, the ocean, the way of life made it an easy choice. The reason we chose Casa del Mar was also quite simple--it offers the most exclusive, luxurious environment but without the hassle of some of the larger resorts. Located in the Corridor--midway between Cabo San Lucas and San Jose del Cabo--Casa del Mar is one of the only 'low-density' resorts in Cabo. Built by the famous Corona dynasty this resort features acres and acres of lush oceanfront land but with a only very small number of condos and a boutique hotel. This is not a high-rise resort with people packed in to optimize dollar potential...Casa del Mar is truly a magical and unique setting. It still offers all the upscale amenities like a World Famous Golfing, Spa, restaurants, bars, numerous swimming pools, tennis courts, and more as well as being direct neighbors to Las Ventanas Resort. So...we bought our second home here in 2004 and enjoyed our beautiful ocean view one bedroom condo for years. Then we had two children and found that we needed more room. Once we decided we were going to buy another condo--this time a two bedroom--it was a simple decision of where our new place should be. Casa del Mar Golf Resort and Spa! Because we already owned a one bedroom at Casa del Mar and spent many years enjoying it and the resort in general we had a very good idea of where the best condos were at this resort. We looked endlessly for just the right unit and because of our familiarity with the resort we knew where we wanted to be. We chose this unit, La Playa 201, for many reasons. First of all, this unit is OceanFront. There is not a thing between this unit and the gorgeous Sea of Cortez--except about 100 feet of sand! We are on the second story so the views and privacy are incredible however the front door of the condo is on 'ground' level so that means no steps--which is great for bringing in kids, groceries, luggage, etc. This condo has no steps inside and the bedrooms are separated by the living areas. This is wonderful for our family but also for renters travelling with two couples. Most of the 2 bedroom condos at this resort have one small master bedroom with the second bedroom directly behind it meaning the second bedroom does not have views or patio access. Also, other 2 bedroom condos have smaller living rooms or windy staircases (difficult to navigate with suitcases, children, etc.) Additionally the reason we chose La Playa 201 was because of its location to the resort amenities. We are just steps to the hotel lobby, restaurant, bar, spa, main pool and parking. However, because we are oceanfront we do not overlook the main pool and restaurant area which some of the other condos do--making our unit less likely to hear the resort noise. We are also just a few steps to the famous Las Ventanas Resort from this condo as well--and we often head there for sushi or drinks in case we feel like something a little different but dont want to get in the car. Truly, this condo is the Perfect vacation spot and we invite you to stay at our home away from home. It was the perfect holiday! The condo is well equipped, has a beautiful view, large patio, and we fell asleep to the waves each night. We would definitely choose to come back if we return to Cabo. Thank you! This property is so good this was my 3rd stay. Always good and can't wait to go back. This condo is in an ideal location for relaxing. Casa del Mar is a very quiet complex if you are looking for a laid back time. We spent lots of time out on the nice sized balcony. Reading, having meals, napping, watching horses go by, etc. We didn't see whales this time, but several days manta rays could be seen traveling near the shore and leaping out of the water. Fireworks on the beach 2 nights. Perfect weather. Highly recommend! Rest and relaxation in paradise! Great week at an awesome condo! This is an awesome condo and the pictures represent it very well. The space was perfect for our party of 5. My wife and I had a private master with bath, while our college age girls had their own room and bathroom. The outdoor living space was perfect with ocean view and it was nice to watch the sunrise with coffee in the AM. The kitchen has all you need to plan some easy meals in the condo. The condo is about a 20 minute drive into Cabo San Lucas which wasn't bad. It was about a 15 minute drive into San Jose Del Cabo in the other direction. The condo was very quiet with only the sound of the waves. La Comer is a great store for groceries and anything you need. It's about a 10 minute drive. There is also a Starbucks in the same complex. They only thing I wouldn't recommend is the OPTIONAL resort fee of $30/day paid to the adjoining hotel. We only ate on premise once, brought our own drinks to the main pool, and the condo has its own beach towels. If you are renting a car, I highly recommend Cactus Rent a Car. They provided a solid vehicle which was a lot cheaper than the major brands. We also took advantage of the Los Cabos Passport which saved us a lot of money on meals and excursions. The owner/manager were very easy to work. The condo was very clean, and we will return! The property and resort were pristine. The view from the condo was amazing. The pool was located just steps from the condo making it very easy to refresh drinks and snacks. Most days we were the only people at the pool. Cabo nightlife was only a short cab ride away. Perfect and relaxing stay. Midway between San Jose del Cabo and Cabo San Lucas this area is known as the Cabo Corridor. It is famous for world class beaches, golf courses, luxury resorts, swimming, snorkeling, tennis, and more. This condo is ocean front at the 5 star Casa del Mar Golf Resort and Spa. One of the largest and most sought after locations at this resort, this condo has just undergone a complete remodel and features granite kitchen with stainless appliances, marble and stone bathrooms with seamless showers, and two oceanfront master suites with an enormous balcony. Let the ocean lull you to sleep. Close to the hotel lobby, restaurants, pools, spa and other area resorts such as Las Ventanas, Palmilla, Hilton. 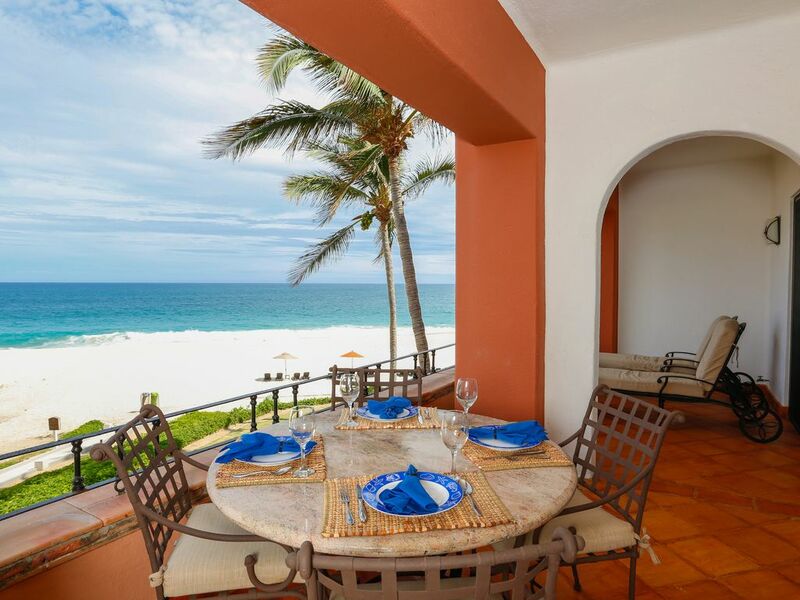 Golf: The world famous golf courses of Cabo Real are withing walking distance to this condo.